It was announced today that W2 Media, the Los Angeles and Vancouver based film distribution, financing and international sales company, has acquired the English language remake rights to Arto Halonen’s highly acclaimed, award winning Finnish feature PRINCESS, based on the amazing real life story of cabaret dancer Anna Lappalainen. The announcement was made by W2 Media CEO John Flock. W2 Media will fully finance the English language remake with an eye toward aligning with A-list female talent for the picture. W2 will also handle worldwide sales for the new English language version. W2 Media’s President of International Sales & Distribution, Julie Sultan, brought the project to W2 and will begin discussions with buyers at the American Film Market (AFM). Produced by Art Films production AFP OY, PRINCESS stars many of Finland’s leading actors including Katja Kuttner, Samuli Edelmann, Krista Kosonen and Peter Franzen, and is the fiction film debut of the award-winning documentary filmmaker Arto Halonen, director of Shadow of the Holy Book, Pavlov’s Dogs and The Magnetic Man. Based on a true story, PRINCESS tells the remarkable and heart felt story of Anna Lappalainen's redemptive struggle with insanity. In 1945, Finland's Kellokoski Psychiatric Hospital accepts a new patient, former cabaret dancer Anna Lappalainen. Diagnosed with manic depression and schizophrenia, she refuses to answer to her real name, insisting instead that she is a Princess and a member of the British royal family. “Princess” demands to be treated with respect, declares the hospital her castle, and holds court with a makeshift collection of ladies-in-waiting. Her delusional charm, and eccentric manner has a surprisingly positive effect on the exhausted hospital staff, the quirky patients, and even the local villagers. The primitive psychiatric procedures of the time insulin shots, electroshock therapy, and daily "cognac" treatments have no effect on her condition, and soon the stern Doctor Grotenfelt recommends the modern procedure of lobotomy to end her royal delusions. But before his treatment can begin, the nurses argue that life for their patients has never been better, since the arrival of their "Princess." In 1995, her memory was honored by a memorial monument in the Kellokoski hospital grounds designed by sculptor Rauni Liukko. It is allegedly the only monument in the world dedicated to a psychiatric patient. The statue symbolizes the flow of life, and is a tribute not to Princess alone, but to all patients who have received psychiatric care. The original screenplay for PRINCESS was written by Pirjo Toikka, Arto Halonen and Paavo Westerberg. 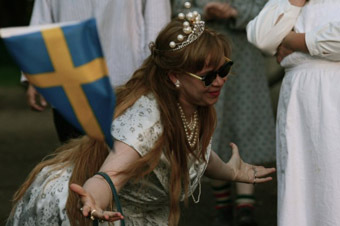 PRINCESS has received numerous awards and international recognition, including the Finnish Oscar equivalent, the Jussi Prize, for Best Actress. In addition to winning the Grand Prix for Best Film at the Cape Winelands Film Festival, Special Mention at the Festroia International Film Festival in Portugal, and the Best Actress award in the main competition at the Tallinn Black Nights Film Festival in Estonia, PRINCESS was chosen for the Dragon Award competition for Best Nordic Film at the Goteborg International Film Festival. In addition to its critical acclaim, PRINCESS has received a series of social and cultural awards, given to director Halonen in recognition of both PRINCESS and his career as a whole. W2 Media is a motion picture distribution company operating out of Los Angeles and Vancouver that acquires both completed films and film packages for domestic, international and/or worldwide distribution. Through its affiliate, W2 Entertainment Finance, W2 finances tax credits and other production incentives, provides cash flow against domestic and international pre-sale contracts, funds print and advertising expenses for studio and independent releases, and arranges gap financing on quality feature projects in the $2 million to $25 million budget range. “Toast” is an adaptation of UK food writer Nigel Slater’s best selling memoirs of his childhood, starring Helena Bonham Carter, Ken Stott, Victoria Hamilton, Freddie Highmore and Oscar Kennedy. The film is directed by SJ Clarkson (“Bad Girls,” “Heroes”) and produced by Faye Ward (“The Other Boleyn Girl,” “Tamara Drewe”) for Ruby Film & Television. Set for U.S. theatrical release on November 11, “Pete Smalls is Dead” stars Peter Dinklage, Tim Roth, Seymour Cassell, Rosie Perez, Steve Buscemi and Mark Boone Jr. and is directed by Alexandre Rockwell. Rockwell also wrote and produced the film with Brandon Cole. Producing alongside Rockwell and Cole were Floyd Byars, Paul Hudson, Dan Kreston, Jen Li and Sean-Michael Smith. Art Films Production AFP Ltd develops and produces creative, quality films. The company’s main focus is on fiction films and documentaries, and the company has developed and produced animation projects. Since the company’s first incarnation in 1987, Halonen’s films have sold to 20 countries; screened at festivals, on television and in cinemas worldwide; and have received numerous international awards.